"I have just received the 3 books and I want to thank you and say that this is the most complete and well elaborated material I have seen in my 15 years as a teacher. Peace for the American people, specially in the New Orleans." "I received the books...EXCELLENT BOOKS! 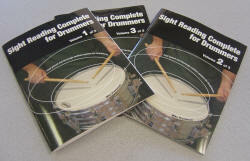 I've been needing a simplified way to help teach sight-reading and promote self-study. I will suggest them to my students and probably buying more of them!" For Snare Drum! Learn new rhythms! 1,141 downloadable MP3 files to play along with - Awesome system, improve your timing!